I have been visiting the litter of seven puppies since the end of August when they were 2 weeks old. Each week I posted images of the puppies on Facebook. And when they were 4 weeks old I picked Ursula as the one I’d keep. When she was eight weeks I took her to get her first series of vaccinations and a deworming. 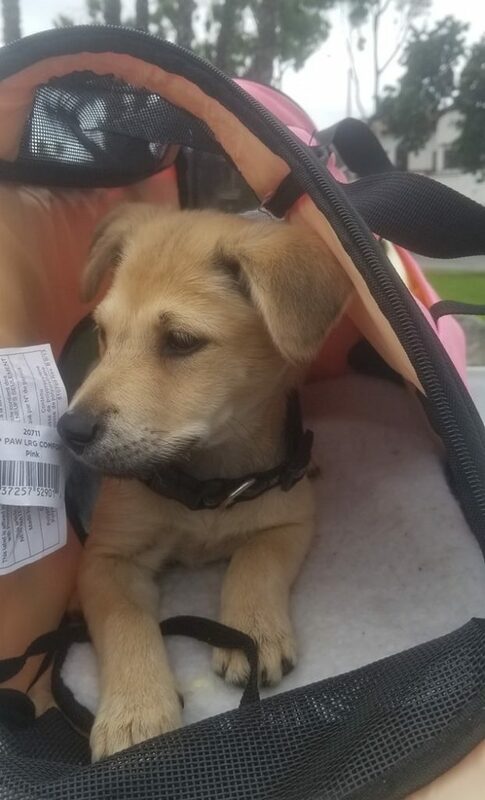 Being 8 weeks old I wanted to bring her home with me after the clinic visit. But the woman I was getting her from insisted she stay with her siblings for a few more weeks. I finally agreed and left without Ursula, so she could be a part of her litter for a bit longer. Then 2 weeks ago October 24th about two weeks before I was to take custody of her the woman who was giving me one of the litter contacted me to tell me that Ursula had just been hit by a car. I called the woman and after determining that the puppy was not in any life threatening danger I went to see the puppy the next day. By Monday my next day off, I had x-rays done and was told that either she go through an expensive operation to save the leg (Probably $ 4,000) or it would have to be amputated, which still would cost over $ 1,500. But the decision had to be made quickly for the health of the young dog. I had visited these puppies for at least an hour each week for two months and I didn’t want to just let Ursula go without at least trying something that could help her. Social media is a great tool and sounding board for situations like this. And since I started the media album “The Adventures of Ursula Seven” on my Facebook profile, many of my friends also got to see her photos and knew I was about to adopt. With this new information from the x-ray vets, I found myself unsure of what to do about the situation and this high cost bill to save the leg was way out of my price, to amputate was also very expressive, so I made a post on Facebook for advice from friends. I was surprised at how little time passed before I received answers and more importantly good wishes. The same day I posted about this, my friend Alec Peters messaged me and told me that he knew people from animal rescue in my area and he would find a low cost vet. Alec is a huge dog lover and rescued three dogs of his own last year with his girl friend Crysstal. My hopes were elevated. 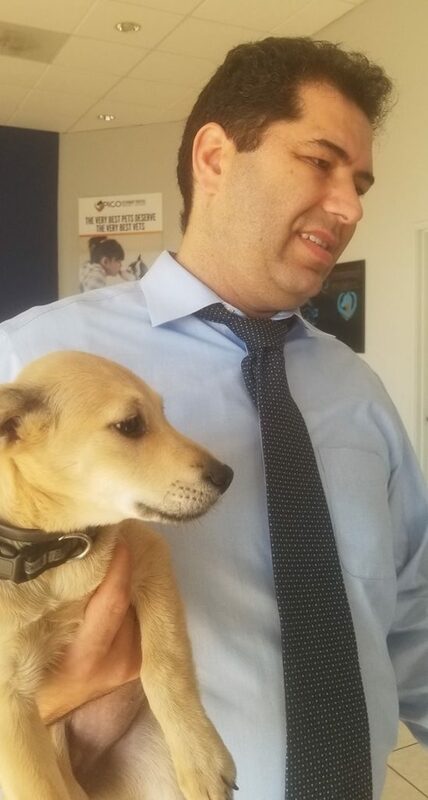 He contacted one of his rescue friends, Judy Race, a long time animal rescuer, and she put us in contact with Dr. Amir Liaghat of Pico Veterinary Hospital, known for working with dog rescues. Judy had a special deal with Dr. Liaghat and when he found out I was working with Judy, I was part of the family! The Doctor said from taking a look at the x-rays that he believed that Ursula would only require one operation for her hip, to place the joint back in it’s socket. I told the doctor over the phone that we were short on funds, that I really never had the chance to start getting insurance for her, even though that is the plan. I informed him that we would be doing a fundraiser after (if possible) we received the invoice. He was very accomodating and it was clear that taking care of Ursula was his main concern. The day after bringing her to the Hospital, the doctor phoned me to tell me that she would be okay with one procedure and that he would operate right away. Thank goodness for getting in contact with the right people! The next day I phoned the Veterinary Hospital and they told me she was doing great and that she was eating and happy. They told me that she was frisky and seemed ready to come home. On Thursday of last week November 8th, I picked up Ursula She was a bit disoriented but happy enough to see her alpha male by piddling, actually a good sign. The Doctor was pleased though to see her using the leg and putting a bit of her weight on it the day before, and when we left the office. Right now Ursula is back home with us and taking medication for pain and an antibiotic to help the healing. Sometimes she will put her weight on the leg, and other times she favors the limb, but she plays and bounds about like any healthy young puppy. Well on her way to full recovery. I will bring her back to the Veterinarian so he can see her progress. 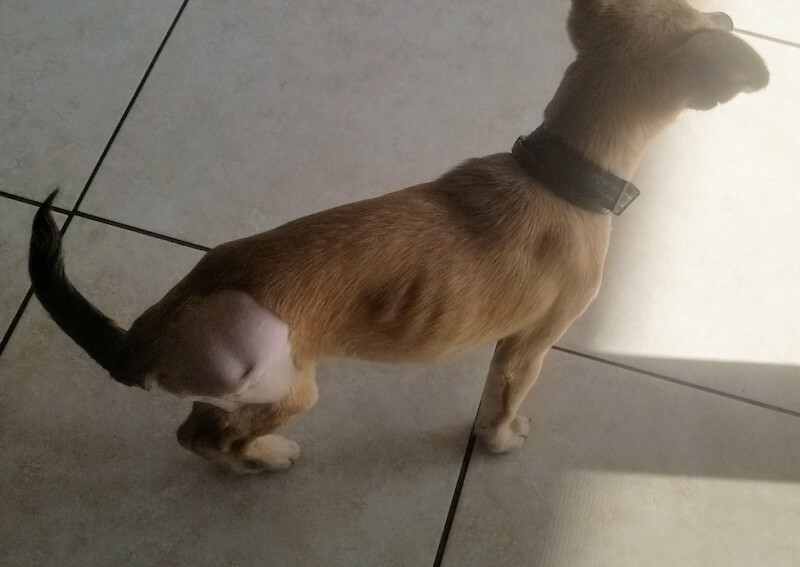 So I am asking for your help to take care of Ursula’s bill. Our goal is $1600 for all that they did at the Pico Veterinary Hospital and the great care they provided, and for the first set of x-rays. 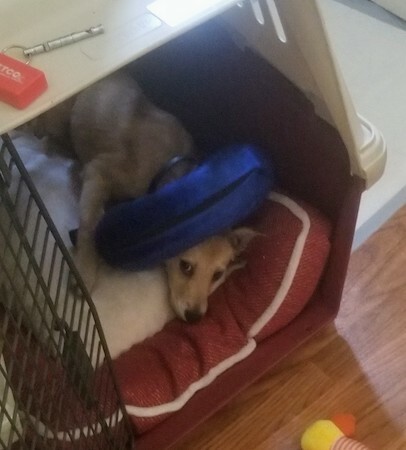 I’ll do the rest, and once she heals, I’ll be getting her pet insurance as well, in the event that such an accidents happens again in her life. As soon as she feels better we will also start training in earnest. She is happy, fun and very friendly, not to mention quite smart for such a young dog. Thank you to Alec and all Axanar fans for all of your support, and if you want to help out, our GoFundMe is here.